Second page of the My Little Pony style plushie pattern. what size print do you suggest for anyone printing this out? just wondering because this is awesome! SO that's how I draw a Pony? Can't wait to make this for my daughter! Awesome! I'm going to make it now! is this the same pattern you used for this? thanks so much for making this. ok now where will i get gray fabric? Your patterns are awesome, by the way, and I've also modded this one to make a donkey. I haven't got pics of it up yet, though. Thank you for the pattern MLP. But I have enough trouble finding patterns for manes, you would have ? is there a print friendly version of this pattern??? IT doesn't recognize MS Paint or anything? Looking great! I think this will be my first pattern I'll attempt Thank you very much for the awesome post! When you sew, the outer side of the fabric is placed together. Look at the pictures in the tutorial. You sew it together inside-out, then turn it right side out. oh, thanks that all i needed THANK YOU! Ill be sure to try this. I'm curious, about how big are the plushies when finished? About 8 inches, if I remember correctly. Thank you!! I have three little girls who are keeping with my MLP obsession, so I will be trying to make one of these in the near future!! Awesome, thanks!! how do you make wings/a horn? I'm very curious and would just LOVE to know! I have a very simple wing pattern with the beginner pony pattern, and there is a terrific horn tutorial at - I'll be giving out more comprehensive instructions when I finish the new basic pattern. I was just wondering if you could (pretty please) post a pattern for Pegasus wings and unicorn horns? And (being waaaay too hopeful here) maybe even mane and tail patterns for the mane six? Pretty, pretty please? But seriously - I am working on a new version of the pattern that has those. 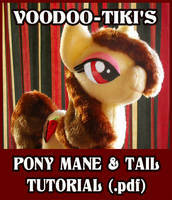 In the mean time, check out the patterns & tutorials folder at there are wing and horn instructions by other artists there. Thank you SOOOOO much! That's really helpful! [link] Pattern used again. Thanks for posting up this pattern! I am going to use this... for so much evil. Okay maybe not evil, but there will be pony shenanigans. ill be using this for my first plushie do you recommend sewing by hand because I don't have a sewing machine ? Thanks for this as well! did you come up with this?